2Department of chemistry, Faculty of Science, University of Douala, Cameroon. Herein, a theoretical study on the stability of some vic-dioxime complexes of Ni(II), Pd(II) and Pt(II) in gas and aqueous phases is reported. The DFT/M06/SDD and DFT/M06/6-31G+(d,p) levels of theory were adopted for the metal ions and for every other element respectively. 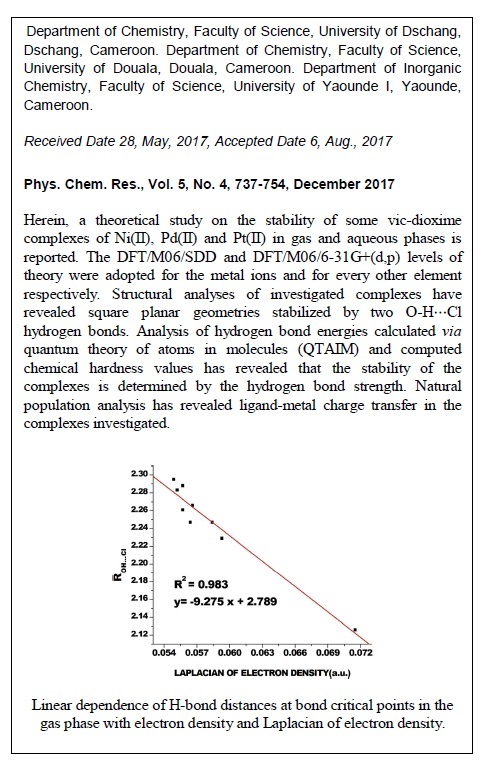 Structural analyses of investigated complexes have revealed square planar geometries stabilized by two O–H⋯Cl hydrogen bonds. Analysis of hydrogen bond energies calculated via quantum theory of atoms in molecules (QTAIM) and computed chemical hardness values has revealed that the stability of the complexes is determined by the hydrogen bond strength. Natural population analysis has revealed ligand-metal charge transfer in the complexes investigated. 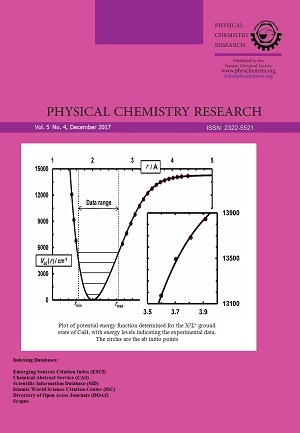 A good linear agreement with correlation coefficient 0.992 has been found between calculated and experimental IR vibrational frequencies, indicating the validity of the theoretical method employed herein. Negative binding energies obtained are indicative of the stability of the complexes, thus affirming the use of vic-dioximes ligands as potential d8 transition metal eliminating agents in solution.